Good morning, Traders! Before we jump into today’s report- it’s February 29th- so we’d like to wish our readers a Happy Leap Day! On this, the rarest of occasions, we thought it’d be interesting to use our archives to do a four year time-warp back to the last leap day and see what we were talking about. 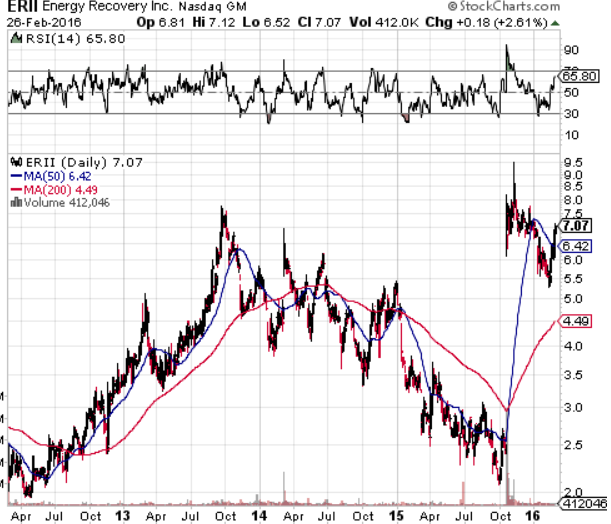 It turns out that we had signaled Energy Recovery, Inc. ERII as a bottom-play opportunity on the morning of February 29th, 2012, and it turned into one heck of a long-term idea. The stock actually ran from it’s then-price in the 2.50-range to nearly 8.00 over the course of the next two years! Flash forward to the current situation; ERII has been trending upward for the past two weeks solid, after having just announced an upcoming share buyback program a few weeks prior to that (>>View PR). Meanwhile, we have an RSI heading toward the power zone, and a MACD (not pictured) showing sharp upward divergence. We’ll monitor the stock in coming sessions on the chance that it continues the nice head of steam it has built up at the moment. We first introduced IORG to our reports two Fridays ago, when the stock was trading as low as .62, and it has since gone on to reach a high of .88. This 42% rise came on relatively light volume. Given that IORG has such a low float (just 14.4M shares outstanding) it’s possible that only a slight amount of buying pressure can effect even larger gains than we’ve seen thus far, so we’ll have an eye peeled for increased activity. PVHO first began appearing in our reports a few weeks back, and has continued to do so with regularity. On the day of our initial mention we observed a PPS of .084, and subsequent high of .18 (+114%). That was followed by an eventual dip back to .106 before rocketing to a new high of .25 (+136%). We’ll continue to track PVHO as long as it keeps inching its way up the chart. Among our options daytrading ideas from Friday morning’s report, one stands tall among all the others. The PANW Weekly $147 Calls ran from .10-2.00 for an incredible 1900% rip, marking not the first or second, but *third* gainer of 1500% or more for the week! Our fresh options idea in yesterday morning’s report panned out very well for us when all was said and done. We highlighted a range which encompassed six sets of contracts, the CRM Weekly $67.50-70 Calls, and regardless of which strike point was chosen, hefty intraday profits were there for the taking from around lunchtime, right up until the close. The magnitude of the potential profits we observed were certainly not as epic as the two separate chances at 1500% gains provided to us by our Macy’s calls from earlier in the week, but in and of themselves, still very impressive. We must be doing something right when a 500% rip begins to seem small by comparison! In an attempt to extend our extreme good fortune with options plays this week right up to the end, we’ve prepared a couple of ideas* for possible day-trades based on premarket activity this morning. *Pertaining to both of the preceding ideas, remember to always consider the inherent elevated risk associated with trading weekly options contracts on a Friday! After USAR offered us the chance at intraday gains of up to 51% on Wednesday as it ran from .0093-.0148, we suggested that a bounceplay could be in the cards, given the volatility we had observed- the stock had pulled back considerably toward the end of the session. The rebound we referred to did come to pass during yesterday’s session, as USAR traded up from its daily low of .0071 to a high of .0098. That represented a modest but solid 38% move on the day. We placed AGTK in our reports multiple times earlier this month, and the stock has responded with quite a nice performance in the intervening weeks since those tags. Shortly after our most recent mention, we’d observe a low of .003 followed by a steady ramp-up at first, giving way to more significant increases this week. It culminated in a high of .0121 yesterday which marked an overall swing of 303% in fewer than a dozen sessions! Based on its heightening activity, we’ll continue to leave a slot open for AGTK on our radar screens moving forward. The latter portion of the session saw USAR slide back to new daily lows in the high .006-range. With such volatility present in the stock, we’ll certainly need to exercise caution, while at the same time continuing to scan for similar chart activity that could lead us to similar intraday gains moving forward. After serving up the chance at a 1500% intraday gain on Tuesday, our range of observed contracts, the M Weekly $41.50-45 Calls, had already served their purpose wonderfully. We expected to see those contracts continue to make moves if the trading action in Macy’s stock allowed for it, but even we were blown away when yet another 15-bagger surfaced for the second consecutive session! Today, we’ll look to possibly take advantage of the activity in CRM in the wake of its untraded-upon earnings beat yesterday. We’re going to zero in on the CRM Weekly $67.50-70 Calls for daytrade opportunities today and possibly even swing-trades into tomorrow. We also want to provide a quick update on the success of another recent interest of ours. We’ve been tracking MXSG all month, and after seeing the stock trade as low as .0016 when we first started including it in our selections, we’ve witnessed it rocket to a new high of .008. That’s a huge 400% increase in just a few week’s time! After catching the news that PCSV had entered into the world of drone racing via an acquisition announced on Friday, we tagged the stock for extended-term watch. What has followed is three excellent sessions of higher recorded highs and lows, along with a monstrous percentage increase. From Friday’s low of .025 which was logged on the heels of our initial alert, PCSV attained the new high mark of a dime yesterday, which works out to an incredible 300% surge. We’ll continue to track its performance as we head through midweek, looking for the stock to maintain support above a nickel on any course corrections that may occur. EGYF is a stock that we’ve been tracking for exactly three months now, having already witnessed double-bag moves out of it toward the end of the calendar year. We re-tagged it in yesterday morning’s premarket report just in time for our readers to catch a chance at some premium intraday gains. EGYF ramped up steadily throughout the course of the day, and ended in a flash of brilliance as it ran hard into the close. When the dust finally settled, we’d witnessed an intraday run from .0044 to .0094, which comes out to a rock solid 114% pop! After an impressive earnings beat from Macy’s yesterday, we signaled our interest in a wide range of options contracts, the M Weekly $41.50-45 Calls, and each and every one gave ourselves and our readers the opportunity to realize some big-time profits on the day, with the $43′s registering the biggest move, a jaw-dropping 15-bagger! Vape Holdings, Inc. VAPE – This stock has been appearing in our reports sporadically for several months, and yesterday we re-mentioned it just in the nick of time to allow ourselves to catch intraday gains of up to 98% as it surged from .0045 to .0089. It marked a single-session gain of 98% and was by far the most impressive play of the day. CTI BioPharma Corp. CTIC – We’ve been hot on the trail of CTIC since releasing our morning report last Wednesday, and yesterday the stock continued to push its upper limits as it has done each day since. On the morning of our initial alert we observed a low of .45 in CTIC, and as of yesterday’s high of .71 had seen a solid increase of 60% in a span of just four sessions. Arcis Resources Corp. ARCS – Despite falling to new daily lows over the course of the afternoon, ARCS did provide an opportunity for quick-witted traders right at the outset of the session. The stock rapidly ran from .0026-.0057, representing a shot at up to 119% in gains before the bottom fell out. The stock closed at its low of .002, so we may want to scan for the possibility of an upcoming bottom-bounce. Added Note: Seeing healthy activity out of VAPE and ARCS, both cannabis-related stocks, reminds us of another play in the space that has made some big moves for us in the past and has just started to come up off of a bottom. That’s why we’ll also be watching GreenGro Technologfies, Inc. GRNH in sessions to come. Macy’s, Inc. M – Macy’s earnings and guidance are engendering investor confidence in the firm’s ability to streamline its business in 2016, and adapt to the changing marketplace. The resultant chart activity has us interested in tracking M Weekly $41.50-45 Calls. 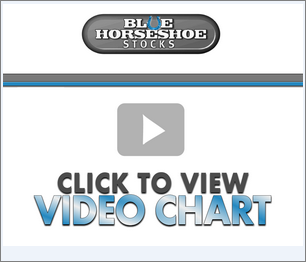 The Home Depot, Inc. HD – In this case, our target range is going to be the HD Weekly $125-129 Calls. Home Depot issued its report citing record earnings, and restated its plans to move forward with an $11B share repurchase program to be transacted by the end of fiscal 2017.